Join our team providing coaching and mentoring to survivors of traumatic brain and spinal cord injury in a vocational setting. Apply for the Job Coach position now! For NeuroRestorative and The MENTOR Network, a Job Coach is critical to our success and exemplifies the wonderful mission driven work we do here every day. To that end, the Job Coach role is a fantastic role to continue your career path in Social and Human Services with a myriad of career options to move up and across the organization. 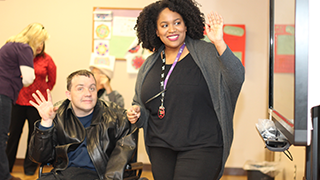 NeuroRestorative is seeking a Job Coach to coach vocational program participants, oversee community employment goals, vocational development goals, and related program functions. This individual will also implement Individual Service Plans and promote vocational skill acquisition and independence of each program participant.